We present the debriefing of this highly interesting meeting for BÜHLMANN diagnostic products. 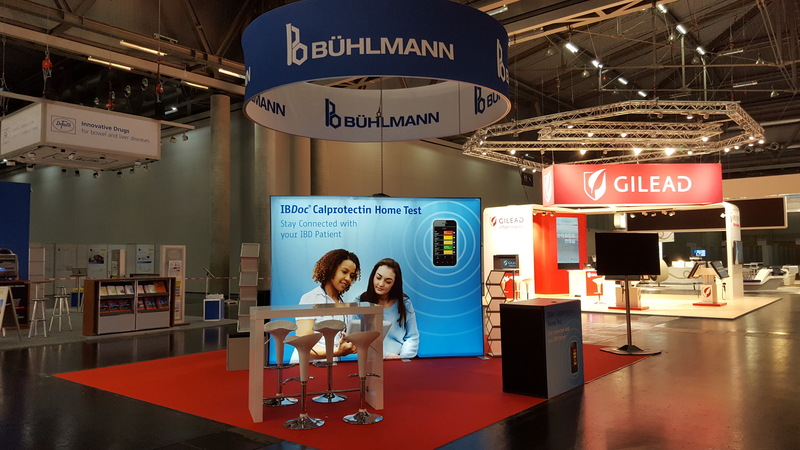 Numerous ECCO IBD abstracts contained data produced by BÜHLMANN assays, mainly calprotectin and biologics trough levels by Quantum Blue® and by the IBDoc® home test. Video poster presentations are mainly about IBD patient therapy management: TDM in Loss of Response patients, as well as proactive therapy monitoring that helps guide biologics treatment and increased cost effectiveness, as well as calprotectin home test data. Impressions and poster presentations from BÜHLMANN @ the 13th congress of the European Crohn’s and Colitis Organisation 14th to 17th February 2018 in Vienna. Dr. Afif from Mc Gill presents a pilot study for the Quantum Blue® Infliximab rapid test application in loss of response patients. Dr. Rentsch from The Alfred Melbourne shows very promising data on infliximab management supported by the Quantum Blue® Infliximab rapid test and implications for therapy cost reduction. Dr. Maria Pia Santos from the Beatriz Angelo Hospital presents data on an easy integration of the Quantum Blue® TDM rapid test in clinical routine. Pearl Avery from Dorset County Hospital shows very interesting data on the clinical validity and ease of use of the IBDoc® calprotectin home test. Joana Afonso from the University of Porto presents data that confirms the validated use of the Quantum Blue® Infliximab assay to quantify the new infliximab biosimilar SB2. Presentations of BÜHLMANN Posters @ the 13th congress of the European Crohn’s and Colitis Organisation 14th to 17th February 2018 in Vienna.